Obituary – Laird, Dorothy Lottie (Wulf) « Perry High School Alumni Association, Inc.
Dorothy Lottie Laird, former Cushing resident, passed away on Friday, October 12, 2007 in the Elmbrook Nursing Home in Ardmore, OK at the age of 85 years. The daughter of the late Herman Ferdinand Wulf and Lottie Louise Cox Wulf, Dorothy was born on October 24, 1921 in Perry, OK and was reared and educated in the Perry schools. 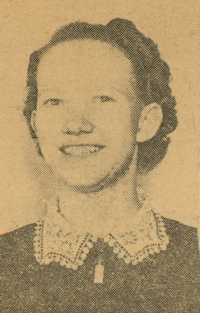 She was united in marriage to S. Carl Laird, Jr. on March 22, 1941 in Perry. To this union, two children, Gary and Dru were born. Carl preceded her in death on January 8, 1999. Dorothy worked as a beautician out of her home for 15 years and worked in the City of Cushing clerk’s office. She was a former member of the First Christian Church of Cushing and was currently a member of the First Presbyterian Church of Ardmore. She was an avid golfer and enjoyed dancing. Survivors include one daughter, Dru Orr and her husband Les of Ardmore; one son, Gary Laird, Sr. and his wife Judy of Chickasha; three grandchildren, Gary Laird, Jr. and his wife Gina, Jody Leake and her husband Darryl and Tracie Chapman and her husband Eric; five great-grandchildren; several nieces and nephews including ,Charlene, Frankie, Evelyn, Marilyn, Kirk and Raymond, Verna Wilson and her husband Roy of Ponca City and other relatives and friends. Graveside services will be held on Saturday, October 13, 2007 at 2:00 P.M. in the Grace Hill Cemetery in Perry, OK with Reverend Larry Haney officiating.